College Square Presbyterian Church, Belfast, Co. Antrim was the setting for the first GI bride wedding of World War Two. Private First Class Herbert W Cooke aged 21 years old was a member of the US Army Expeditionary Force in Northern Ireland from Cleveland, Ohio. On 13th April 1942, he wed 18 year old Miss Thelma Smith but the ceremony should have happened 2 days earlier. Thelma was the daughter of a well-known café owner Edward Smith of 39 Grosvenor Road, Belfast, Co. Antrim. On 11th April 1942, a reporter from the Belfast Telegraph arrived at the Smith household, having found the church locked and deserted. Without consent from Cooke’s senior officers in the US Army, the wedding could not go ahead. That reporter found Thelma hard at work sweeping up her father’s café. Her wedding dress and presents lay in a bedroom upstairs a week after her whirlwind romance prompted a proposal from the American. But I’m not worrying, I guess there is no white showing yet in my hair on that account. I would far rather wait ’til May or June to get married so it doesn’t matter the least bit. Thelma Smith, Belfast Telegraph – 11th April 1942. 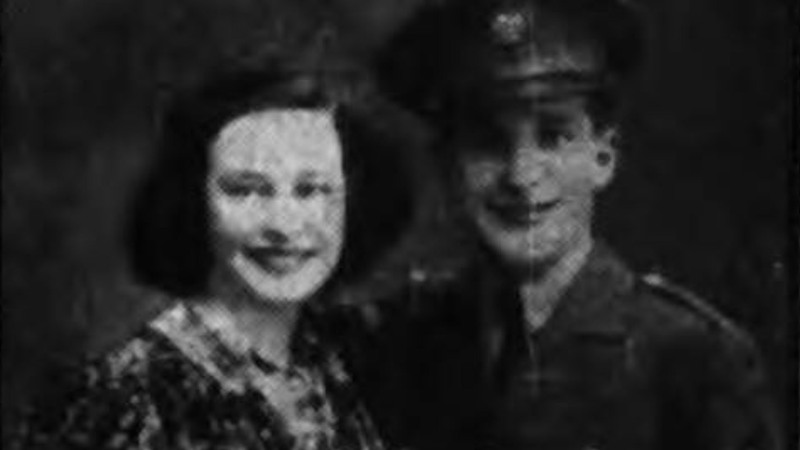 British Newspaper Archive Photo: Miss Thelma Smith of 39 Grosvenor Road, Belfast, Co. Antrim and US Army Private First Class Herbert W Cooke who married on 13th April 1942. Photo from Belfast Telegraph - 8th April 1942. Copyright R Clements Lyttle. The ceremony finally took place in secrecy at 0800hrs with the church doors locked. Only the bride, groom, Reverend WJ Thompson and a required number of witnesses stood in attendance. Assistant minister Mr. S McIlveen acted as best man and Mrs. Isobel Moore was matron of honour. Even the father of the bride found himself locked outside. Miss Smith carried a spray of flowers and wore a blue dress. 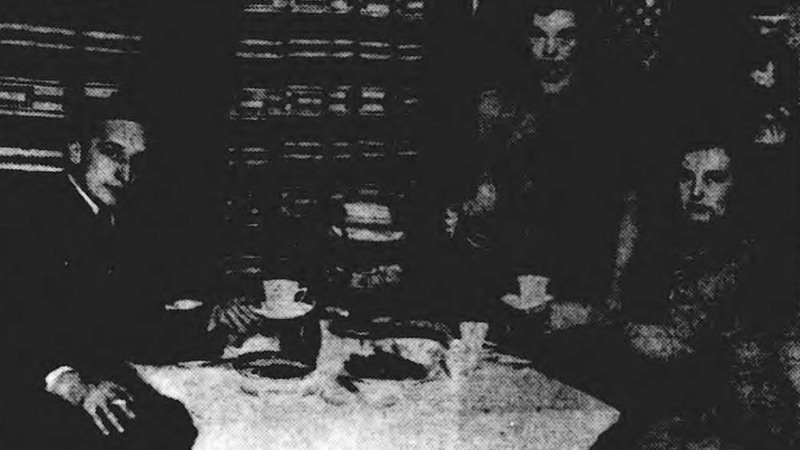 British Newspaper Archive Photo: The bride and groom, Private First Class Herbert W Cooke and Thelma Cooke (née Smith) enjoy a cup of tea with matron of honour Mrs. Isobel Moore after their secret wedding in Belfast, Co. Antrim. Photo from Northern Whig and Belfast Post - 14th April 1942. Edward and Mrs. Smith had given their permission for the wedding to proceed, as had the parents of Private First Class Cooke. The church had received all the required documentation to issue a marriage license. It was not a matter for the Presbyterian Church whether or not the young couple had military approval. After the wedding, the couple spent a quiet day at home as reporters gathered outside the Smith’s café. We’ve just cabled my folks in America and they’ll know all about it by this time tomorrow. Have I anything else to say? Nope, except that we are very happy and hope to stay that way. Herbert W Cooke, Belfast Telegraph – 13th April 1942. With the first GI bride wedding in Northern Ireland complete, it fell to Private First Class Cooke to explain his actions and ask for a week’s leave for a honeymoon. If you enjoyed this post on "The first GI Bride wedding in Northern Ireland", please share with your friends and followers.